Our fuel cells models provide insights into hydrogen technology. Oxygen, which is released from water through electrolysis, is used to produce power. Manuals included provide information, experiment instructions and task sheets. Kosmos fuel cell experiments show how you can generate pure oxygen and hydrogen from water using solar cells and then convert them into electricity in the fuel cell. 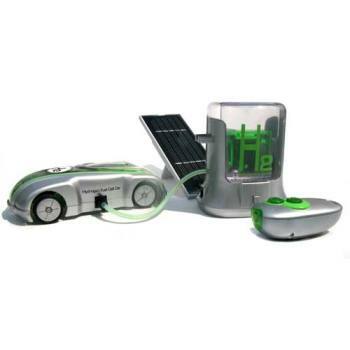 A highlight of this experiment kit is a vehicle that runs using only solar energy and its own hydrologic cycle.